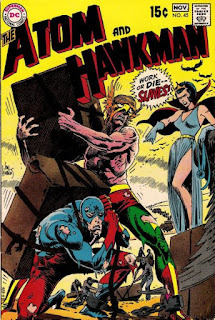 As mentioned in our previous article, the re-telling of Hawkman and Hawkwoman's first arrival on earth (as told in the Hawkworld v1 ongoing series) completely wipes out the previously established history of the Silver Age Hawkman & Hawkwoman. According to Hawkworld, everything you see above did NOT happen. Every Silver Age story from the Julius Schwartz-era (1961) up until 1990, involving Hawkman, did NOT occur. Katar Hol and Shayera Thal have NEVER stepped foot on earth prior to 1990. 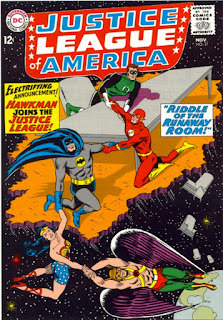 They NEVER joined the Justice League of America in the 60s. Even their post-Crisis material (ex: The Shadow War of Hawkman, Hawkman v2) NEVER happened. Understandably, this left long-time Silver Age Hawkman fans irate as about thirty years of Hawkman continuity went down the drain. Curiously, Tim Truman's 1989 Hawkworld prestige format mini-series, which preceded the Hawkworld ongoing series, did NOT hit the reset button on Katar Hol and Shayera Thol's continuity. Truman's mini-series is self-contained to Katar Hol's life on Thanagar and doesn't effect his adventures on earth. There isn't really much of a time-stamp on anything written in the mini - there are no mention of any other DCU events - and the story could've taken place at any time in DC history. So where did the decision to reboot the Silver Age Hawkman and Hawkwoman come from? 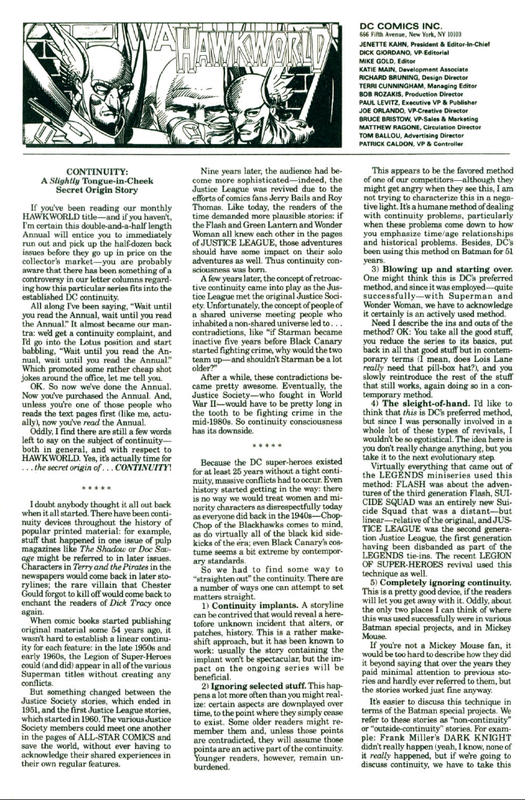 Michael Hutchison: "When the decision was made to introduce Hawkman into the modern era (Tim Truman revealed in a previous interview that you weren't the one responsible for that decision, but he felt strongly against it) instead of "back-dating" the changes from Tim Truman's "Hawkworld" mini-series, did you have any idea how many significant continuity gaps a minor league character like Hawkman was going to open up? Given that you then spent a lot of time trying to retroactively plug those gaps, if you had to do it over again, would you do anything differently?" John Ostrander: "The decision was purely Mike Gold's. I argued against it at the time but Mike was adamant; he wanted the Hawkman series to start up right after the end of the Tim Truman miniseries. All of Tim's stories could've happened before Hawkman arrived on Earth and the series could've picked up with him already ON Earth. My choice was doing it Mike's way or not doing the book. I felt another writer wouldn't have worked as well or closely with what Tim had done so I decided to do the book. I did disagree and still disagree with the premise and the junking of continuity. That said, I'll stand by the stories. There was some first-rate stuff there. If I had it to do over again, I'd fight again to keep from wrecking continuity needlessly. Would I still write the series? I'd think a lot harder this time about it. I took some hits for it over a decision that wasn't mine." "My first obligation to the reader is a good story and sometimes that means breaking with past continuity. I don't HATE continuity; actually, I've been very good with it overall. Better than many other writers have been or are willing to be. I try to keep faith with past continuity without letting it tie my hands. Slavish devotion to continuity is like cultivating kudzu; it's going to strangle everything else you do. With SPECTRE, which continuity do I keep with? The Fleischer/Aparo one? The Moench/Whoever one? Keep in mind that they all got canceled. What I tried to do was use ELEMENTS of each while making a cohesive whole. With Firestorm, I kept to continuity but developed the storyline. With Hawkman -- well, that was an editorial decision that was out of my hands and a given before I came on the book. I later tried to reconcile the continuity as best I could. So I'm respectful of it and past fans but I don't worship it and I won't be hung by it and I think that's playing fair. I was a fan before I was a writer and I go way back so I appreciate the old fan and their concerns but sacrificing new readers to satisfy continuity is, I feel, a big mistake. So I choose a middle path as best I can." 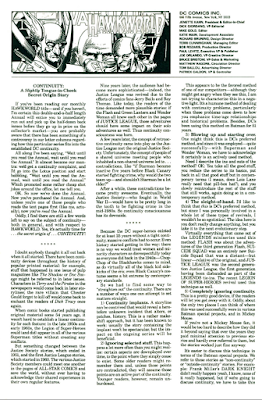 "An editorial decision was made that the monthly would start up right after the Prestige series; it would be the first time that Katar and Shayera were on Earth, despite whatever continuity was there. I tried to explain that all away later; I think it worked, but it wasn’t perfect. I think you can overdo an origin. If you rewrite it too often, the origin just gets muddy and so does the character. Leave the origin alone and just tell good stories." So there we have it. Apparently it was editor Mike Gold's decision. I've never heard Gold's side of the story and, if he's aware of our scrappy DC webzine and cares to comment, I'd love to hear it. Hawkworld readers were very resolute in reminding the creative team about their dissatisfaction with the Silver Age Hawkman/Hawkwoman continuity reboot. Most letters went something along the lines of "I like what you did with the character (giving him layers and all), BUT did you have to throw the continuity away?". One reader even went so far as to point out all of the post-Crisis Hawkman appearances that had been affected. His list included INVASION!, several issues of Justice League International, Animal Man #6, Hawk & Dove v3 #1, Power of the Atom #4, and a few other appearances in other books (including the newly rebooted Superman v2). Meanwhile, Mike Gold assured readers that Hawkworld Annual #1 (1990) would solve many continuity issues. The continuity discrepancies were weighing heavily on the creative team - early issues in the run were being shipped late [ex: issue #6 shipped a month late] and editorial cited one of the reasons as 'spotting a major continuity problem' just before printing. 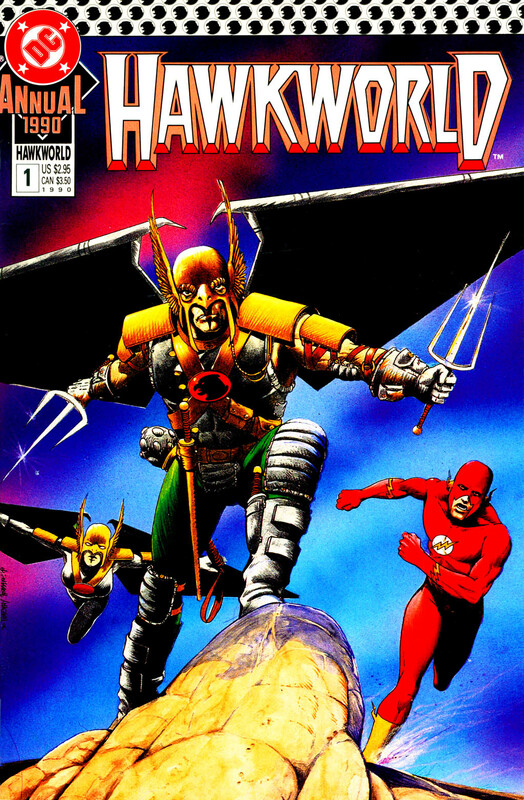 The Hawkworld Annual #1 gave us a lot of things: a Hawkman/Flash team-up, a second appearance of a villain who first debuted in the 1986 Super Powers mini-series, a time-traveling story featuring a few members of the Justice Society of America, the introduction of a new villain (Thrash - successor to the Fiddler), two BIG retcons, and... most importantly... an explanation as to why the Golden Age Hawkman (Carter Hall, an earth man) had the same emblem/logo/symbol/headgear as the Thanagarians (an extra-terrestrial race) who's existence he would not have been unaware of. 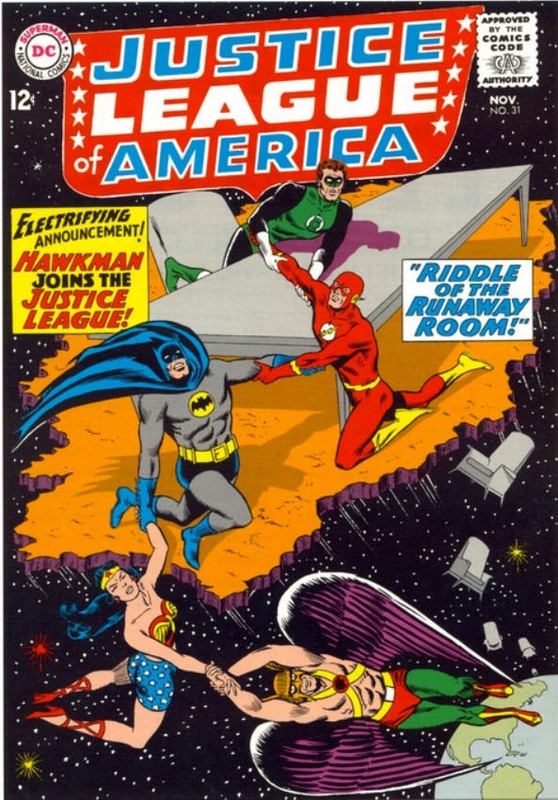 Okay, so Hawkman WAS part of the original Justice League of America - only it wasn't Katar Hol, it was Carter Hall (Golden Age Hawkman). That kinda works - the Pre-Crisis Katar Hol and the Golden Age Carter Hall basically had the same costume anyways. 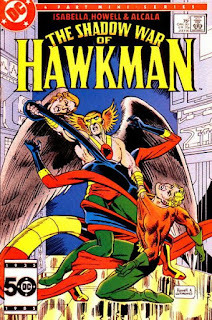 This covers all Silver Age Hawkman appearances up until Carter Hall gets sent to limbo with the rest of the JSA [excluding any pesky story with both the Silver Age and Golden Age Hawkman teaming up or battling each other]. 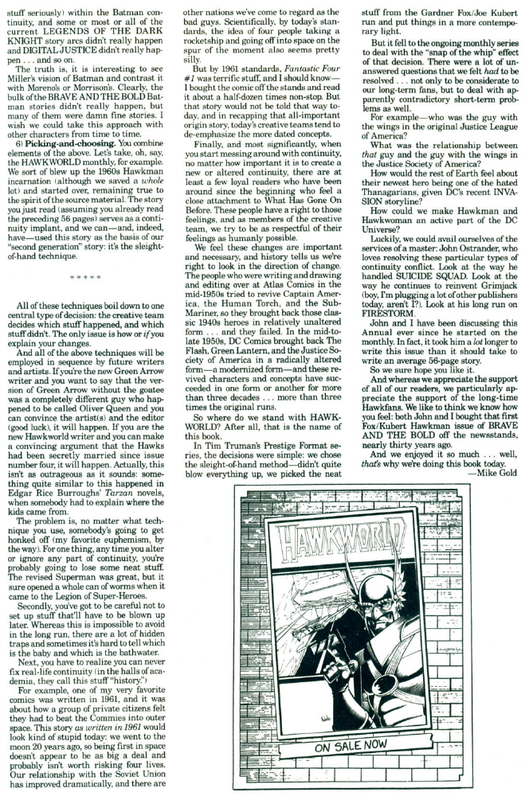 Evidently, all the negative Hawkworld fan mail regarding Hawkman's new messed-up continuity concerned Mike Gold so much that he felt compelled to include a two-pager in the letter pages of Hawkworld Annual #1 addressing these issues. "CONTINUITY: A Slightly Tongue-in-Cheek Secret Origin Story" has Mike Gold explaining the history of comic book continuity and retcons, devices writers use to fix comic book continuity [for anyone interested, he cites 'continuity implants', 'ignoring selected stuff', 'blowing up and starting over', 'the sleight-of-hand', 'completely ignoring continuity' and 'picking-and-choosing'] and points out that Marvel comics has done this frequently in the past, too. He explains that the Hawkworld 'continuity fix' was a combination of continuity implants and sleight-of-hand techniques. He acknowledges that loyal readers of the Silver Age Hawkman might feel "honked off" [his words, not mine] about the changes, but re-asserts that sometimes 'neat stuff' gets lost when you retcon continuity on a legacy character like Hawkman. Gold then casually mentions how Byrne's Superman reboot is great stuff, but really messed up Legion of Super-Heroes continuity. This is the closest thing to an apology that we'll ever get from Mike Gold. It still doesn't explain why DC editorial chose to go this route instead of setting Katar Hol's story in the past, but Gold makes a very compelling case for the challenges involved in retconning Hawkworld and credits Ostrander as a master at resolving continuity conflicts. Gold closes off by stating that it was important that they addressed 1) who 'that guy' in the Silver Age Justice League of America with the wings was, 2) his relationship to the other guy with the wings in the Justice Society of America and 3) how the rest of the DC Universe would react to their newest hero with wings being a Thanagarian (this is in direct reference to the recent INVASION! event in which Thanagarians were one of the extraterrestrial races to invade earth). 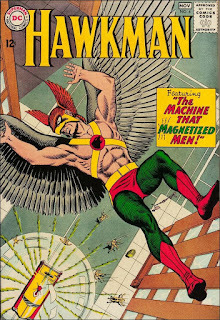 The Golden Age Hawkman (JSA) and the Silver Age Hawkman (JLA), up until The Last Days of the Justice Society , have always been the same 'guy with wings'. Let's just try to forget about the Earth-Two stuff, okay? The reason why the Golden Age Hawkman and Thanagarian soldiers had the same helmet and hawk emblem is because a Thanagarian spy, Paran Katar, was secretly influencing Carter Hall on how to become the Golden Age Hawkman and took that knowledge back with him to found the military force on Thanagar. Well, this answers everything... up to a point. Who was that 'other guy with wings' who appeared in 1985's The Shadow War of Hawkman mini-series, the 1986 Hawkman ongoing series and all of those Justice League International issues (and other random guest appearances) up until Hawkworld #1? Glad you asked, all answers will be revealed in our next installment. 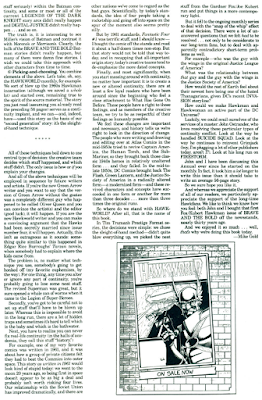 As I was google-searching for Hawkworld Annual #1 cover images to use for this article, I discovered that Luke from the Being Carter Hall blog wrote an interesting personal opinion/review on this very same Annual. Thankfully (for me), Luke's review doesn't contradict anything I wrote, and if nothing else, collaborates this article. 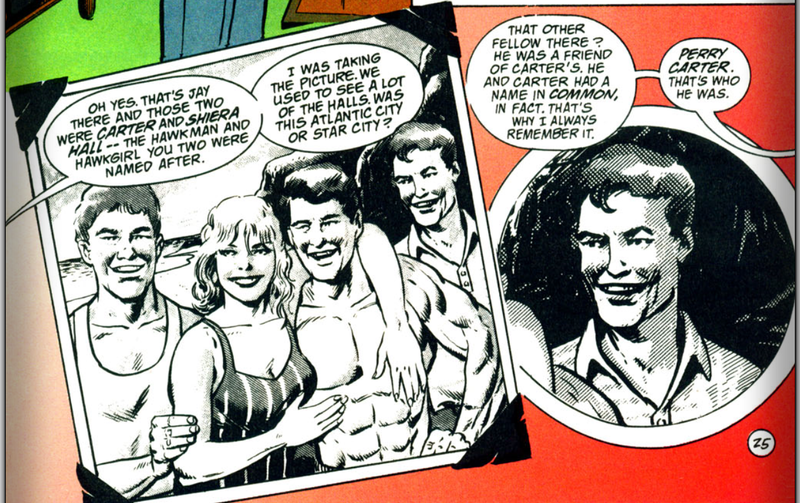 Being Carter Hall is a great site and I highly recommend it - Luke definitely knows his Hawkman lore. 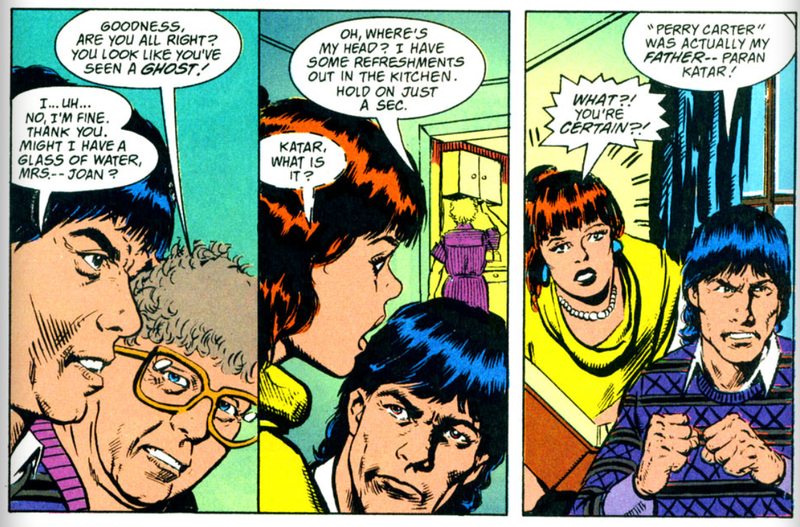 Worth noting: Ostrander subtly disavowed the continuity change by showing Katar and Carter together in a flashback in his Spectre run, in the first appearance of the new Mr. Terrific.